Wren 14k Gold & Black Sapphire Necklace--I'm wearing this in the video, so be sure to watch to see it up close. This was another item we got to choose. It's a small moon (heart and stars were other choices) with a tiny sapphire. $100. Yes--$100! Worth it right there! Overall: Very pleased with this month's box, with the necklace, lip crayon, speaker, and sponge being big hits for me. Highly Recommend! FOR $10 OFF, please use this link. Jelly Pong Pong Cosmetics 2-in-1 Shadow/Liner--This uniquely formulated crayon doubles as an eyeliner for thick, precise lines as well as a perfectly-blended eye shadow. It worked fine but not a must-have for me. Two Tarte products this month! I already have the full size of this and love it. I use it a lot in the summer. Eau Thermale Avène Cleanance Gel Soapless Cleanser--This is a foaming cleanser that worked great but I think oily skin would like it better than my dry skin did. Be A Bombshell Cosmetics Lip Balm--Hydrating formula to leave lips feeling silky smooth with a hint of color. I got French Kiss, and it pretty much has no pigment. I like it fine but I tend to only wear lip balm at night. Overall: feeling kinda meh this month. No big complaints, but I have enough shadow/liners to last me a lifetime. I do love the ikat-print bag! Ipsy is $10 a month, and here's a code if interested! I have been on the biggest iced coffee kick lately. If you drink it, how do you make yours? Great reviews! I'm kinda glad I canceled my Ipsy bag. It's always hit or miss for me. The fabfitfun box looks great this month! I was eh about my ipsy bag too but this month had been better than the last few for me so I'm trying to not complain! I didn't get the bronzer but I'm curious about it being waterproof! The Fab Fit Fun box definitely has my attention! Love that necklace you got, seriously so cute and worth the price of the box itself! wow that's a lot of stuff! Looking forward to hearing your opinion on the Coolesy beachy salt spray. I've been looking for a good one with no luck. Ooh that necklace is just perfect! I loved the ipsy bag this month too. While I loved the Tarte, I wasn't so sure about the other products I received - but they're growing on me. Super excited to see what next month holds! What a cool box! I really need to get a jump rope! That's the best exercise! AH! I miss Ipsy, I had to quit though because I didn't have anywhere to store all my extra products! Wow that FabFitFun box is awesome! 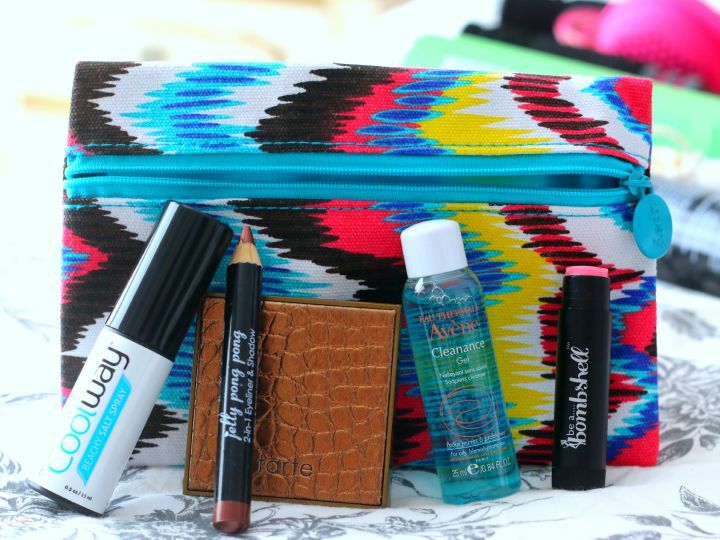 I agree, I love the ikat bag that your Ipsy stuff came with. And I think I'd like the bombshell lip balm if it was in a color you could actually see on your lips. The cleansing sponge looks good as does the lip gloss. My husband uses headspace and likes it! That is totally worth the money!!! I love the necklace & the speaker! I love its got FM radio on it too! YES - please let us know if you did the Head space thing & if you liked it. I'm trying so hard to try to mediate more... I think my head NEEDS it... its so hard to stop all the noise around. I've always wanted to try FabFitFun but looking at the mix products, I'm not sure if I'll like it. Might have to think about it again and maybe try the Fall box. I would love to try a FabFitFun box... that would also make a great gift too! I love listening to you speak; you've got a gorgeous voice! I'm curious how well that vaseline aloe spray works. I'm heading to the beach next week and may pick some of that stuff up. Have you tried that leave in conditioner yet? I'm on a constant quest for good leave in conditioner for my dry, naturally curly hair. Following along and can't wait to read more! The value for the FabFitFun box is pretty impressive. That speaker looks totally adorable! That Vaseline spray on lotion is so easy to apply, but it gave me the worst allergic reaction ever :( But the speaker must be nice! That FabFitFun is such a great box! I love the variety you get and is such a great value. I got completely different products in my Ipsy bag this month. Great items in your FabFitFun box this time. It is a little more expensive than other boxes but you get so many things! The lipstick was such a pretty color on you and the perfume sounds like ti smells so good! I love seeing everyone\s Ipsy reviews. That colorful makeup bag is awesome, too. Great items from each box! Great reviews. I might try the one or the other. Thanks for the information. Beautiful video! Have a great Wednesday. I didn't love the things in my Ipsy this month. The Fab Fit fun boxes are always full of stuff, maybe I'll try one with your code! I'm so happy Vaseline spray was inside that box. I was wondering how good that product was. I definitely have to go out to the store and purchase this. Thanks Elle :). Ooh, love the spray on moisturizer! I'll definitely have to try that one out. I have a spray on sunscreen and it's so much easier. I'm all for a time saver! Nail wraps? Are those just like jamberry wraps? SO fun!! Great reviews! I do love the Ipsy bag but I agree that the Fab box is way better! The FFF box comes with some awesome stuff. 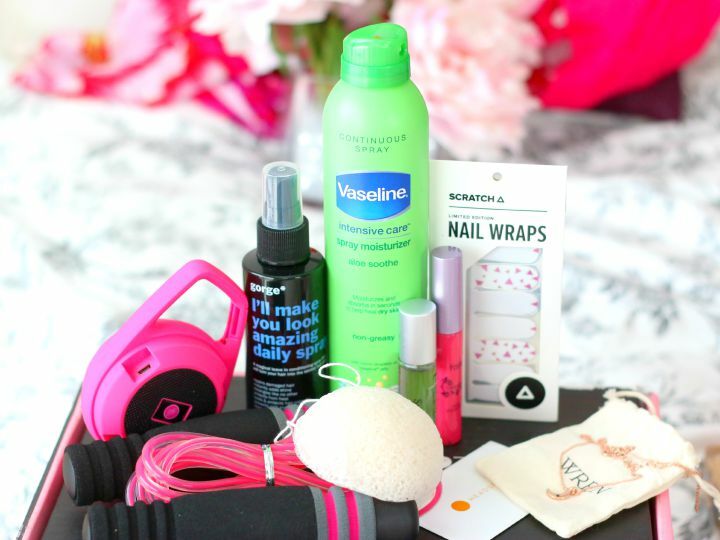 I really want to try out the Vaseline Aloe Soothe Spray Moisturizer and Tarte lipgloss. I love seeing what people get in their Ipsy bags every month. I've never heard of those nail wraps before. I like that you get to pick certain aspects about your box. I love that lip color on you and your necklace is so pretty! I have been wondering about that vaseline lotion sprays work as good as lotion. For iced coffee, I have a keurig so I just fill a cup of ice and brew the coffee over it and add creamer. My favorites are Dunkin Donuts kcups or the Coffee Shop ones from Green Mountain. The little moon necklace is beautiful! I ended up cancelling my Ipsy I ended up having too many things I didn't use. The wireless speakers look cool. I have used the Vaseline spray and i really like it. Both of these subscriptions look fun--that necklace is so pretty and I love Vaseline spray lotion. Bummer that the Ipsy bag wasn't too exciting. I always love seeing you unboxing videos! I ALWAYS like the fabfitfun boxes, but I still haven't subscribed. I think I really need to change that because your box looks awesome! I think I love the necklace most of all! I canceled my ipsy a long time ago. I got so bombarded with samples between that and Birchbox, that I just didn't need. Lately, I will admit I've almost signed up again for it because I've seen some awesome bags! I love Iced Coffee. I make it at night, let it cool and then put it in the fridge (black). in the morning, I put it a glass of ice and add sugar-free vanilla creamer and one splenda. Yum! I also love the cold brew iced coffee from starbucks. I've received a lot of subscription boxes before, but never FabFitFum. Looks like a great summer box! I love Ipsy bag for this month. I have to wait until next month to get mine. Since my bags come a month late. Due to being oversea. I hope you are having a great week. The Fab Fit Fun box is def a hit this month. I wish I got that Tarte bronzer in Ipsy! Does the spray lotion dry quickly? The idea of spraying lotion onto me has always kind of creeped me out. I think it's because the commercials I saw for it forever showed people spraying themselves then immediately getting dressed. Which I wouldn't do with regular lotion anyway. So for some reason I've always had an aversion to it, haha! I love that spray on lotion!